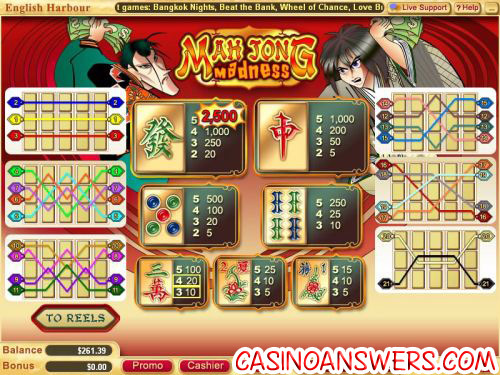 Mah Jong Madness Video Slot Guide & Review - Casino Answers! 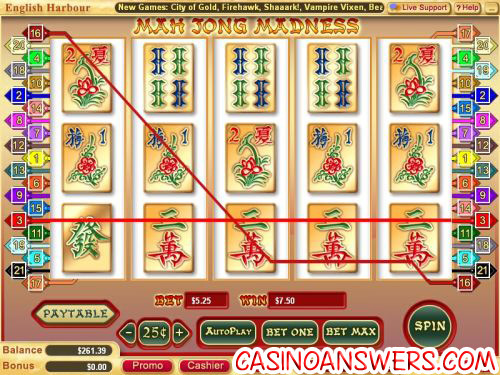 Mah Jong Madness is a 5-reel, 21-line video slot found at online casinos using the Vegas Technology casino software. You can play Mah Jong Madness at VIP Slots Casino and Online Vegas Casino. Play at this years #1 online casino for United States - Slots.LV. Available wagers on Mah Jong Madness are $0.01, $0.05, $0.10, $0.25, $0.50, $1, $5 and $10. The minimum bet per spin with all lines active is $0.21 and the maximum is $210. To play Mah Jong Madness, simply choose your coin value wager at the very left of the green game buttons. Then, choose how many lines you wish to play. You can do this by clicking on the numbers at each side of the game screen or you can hit “Bet One” as many times as necessary. Once you have selected your active paylines, hit the “Spin” button at the right. If you wish to play Mah Jong Madness with all 21 lines active, hit “Bet Max” and you will spin the reels automatically with all 21 lines. Mah Jong Madness has a manual stop feature. If you want to decide when to stop spinning the reels or if you don’t want to wait for the reels to stop, you can hit the “Stop Spin” button. The stop button is located at the right where the “Spin” button is when the reels are static. For those who like to play a lot of spins without a lot of mouse clicking, Mah Jong Madness has an autoplay feature that gives you many different options to choose from. The spin settings are the number of spins (5, 10, 25, 50, 100, 250 or 500) and the number of seconds between spins (1, 1.5 or 2). The stop settings are to stop once all of the spins have been completed, to stop when the jackpot is won, to stop if a win exceeds or equals a chosen value (50, 100, 150, 200 or 250), to stop on any win or to stop if your bankroll increases/decreases by a chosen amount (50, 100, 150, 200 or 250). You may halt autoplay at any time by hitting “Cancel Autoplay,” which is in the place of the “Autoplay” button. Mah Jong Madness is a very no-frills video slot from Vegas Tech. If you’re not looking for a video slot with very many bells and whistles, such as bonus games, free spins or even wild and scatter symbols, you may enjoy Mah Jong Madness. However, we figure this isn’t very many of you, especially because the top jackpot on Mah Jong Madness is a mere 2500 coins. With that said, there is nothing wrong with Mah Jong Madness, it just doesn’t have very many features. If you’re an avid mahjong player or maybe if you are just looking for something simple, you can play Mah Jong Madness at VIP Slots Casino and collect $777 in bonuses while you’re at it! Can US-based players play the Mah Jong Madness video slot? US players can play Mah Jong Madness at VIP Slots Casino, Online Vegas Casino or whatever your preferred Vegas Tech casino might be. What special features does Mah Jong Madness have? Mah Jong Madness has no special features beyond what you can find at any slot machine at VIP Slots Casino. For a Vegas Tech video slot with a lot of special features, try Magic Monkey or The Reel Deal. Where can I find another Asian video slot? You can find other Asian-themed slot machines such as Bangkok Nights at Online Vegas Casino. Or if you are into comics, you might want to read our Cryptologic Elektra Marvel Comics Slot Review. Are there any puzzle slot machines? Is there any casino mah jong games?